Victorian-based tipper specialist Hamelex White has long understood the value of maintaining genuine client relationships, knowing they can help cement a brand’s market share in the long-term. on-going communication can also help the manufacturer improve the product. In fact, Hamelex White’s consistency in the ‘loyalty department’ has become the most priceless component of its operation and helped it grow into a highly regarded specialist brand. Treating clients as part of the Hamelex White family, the key focus is on building and refining the brand’s relationship to the market, as two of the company’s most recent clients can testify. Bee Jays Haulage is a family-owned business specialised in carting grain, fertiliser and general freight interstate to Melbourne and to Perth from its head office in Mount Barker, Adelaide. The 30-year-old company can draw on a staff of 25, and a fleet consisting of 12 B-double tippers, five of which are Hamelex White-built. According to Barry, all five Hamelex White’s are able to carry up to 44 tonnes each. 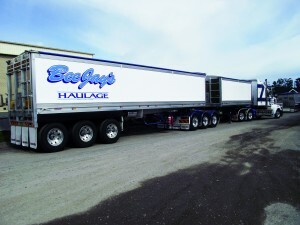 Based on a steel chassis, each B-double features aluminium trays. “All the tippers have standardised steps and access doors on the trays because safety regulations dictate you can no longer climb on top. It is common sense to have that now, because you want a safe product that performs well and that’s where Hamelex White’s products really look after you,” Barry says. 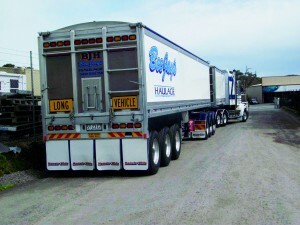 It is the combination of a unique design concept and strong backup service that prompted Yarridale Farms in regional Victoria to opt for Hamelex White as well. 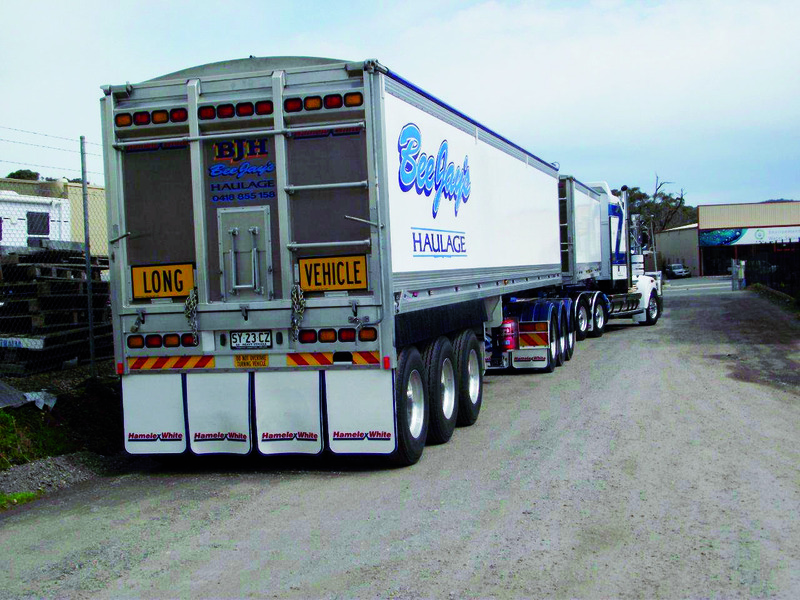 Just like Bee Jays, Yarridale is a family-owned business that operates a 4000-acre farm in the broadacre haulage sector. However, Yarridale’s small-scale operation demands a completely different, more flexible trailer set-up. Co-owned by Greg and his brother Ian, Yarridale services a small, but loyal client base utilising a small fleet of two semi-tippers. The company has been operating since the mid-1990s, and since used the same old equipment. It was not before late 2011 that an opportunity arose to upgrade; and Hamelex White was the first choice when the time came. “We first got to know the Hamelex White product at the 2011 Wimmera Machinery Field Days,” Greg says. “Ian and I had been in the market for a chassis tipper. We felt it made more sense given the rough environment we operate in because the tipper can stay grounded when operating. If it’s a tip-over trailer it’s not quite as safe for us because of that uneven surface. 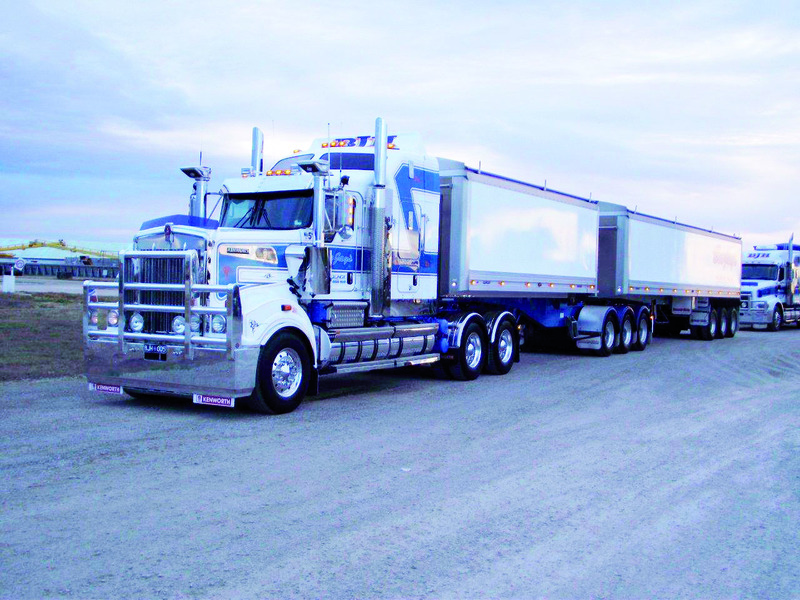 “Because it is only Ian and myself in the business, we prefer to do just short hauls around our area that enable us to accomplish more and cart more load,” Greg says. According to Greg, the two 34-foot aluminium tri-axle chassis tippers have a tare weight of 29.5 and 29.8 tonnes respectively, which makes them much lighter than the 1990s equipment they replaced. When loaded to capacity, both can cart as much as 40 tonnes. The tipper trays also boast access doors, steps and lift axle to meet all official safety regulations and operate more efficiently. But most importantly, Ian and Greg agree the low tare weight has given them the ability to carry more load than what they previously achieved. “It may not sound like much, but being able to cart one and a half tonnes extra without sacrificing the flow of operation can make a huge difference. When you combine that amount over two semi-tippers, inside several hours, that’s a lot of work done in a day,” Greg concludes.